If you're trying to get more healthy seeds into your diet, this dish is a great, easy way to do it. 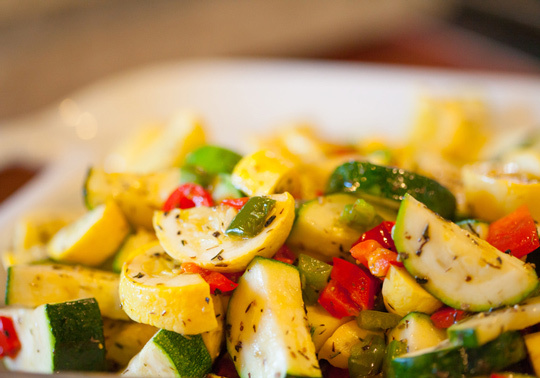 The crunch of the seeds adds depth to the texture of the sautéed squash. It's also a fast, easy side dish. Add cooked chicken to the sauté pan in the last 10 minutes of cooking to make it a full meal. Heat butter or cooking oil in skillet over medium heat. Add onion, and sauté until tender, about 1 minute. Add squash and red pepper. Sauté, stirring, until soft, about 3-4 minutes. Turn heat to low, cover, and cook until very tender, stirring occasionally, about 20 minutes. Combine coconut oil with curry powder in a small bowl. Add squash seeds, and toss until thoroughly coated. Spread seeds onto a cookie sheet in a single layer. Place the seeds in the oven. Seeds are done when they are brown and crispy, about 10 minutes. Serve squash with seeds sprinkled on top. Top with parmesan cheese if desired.